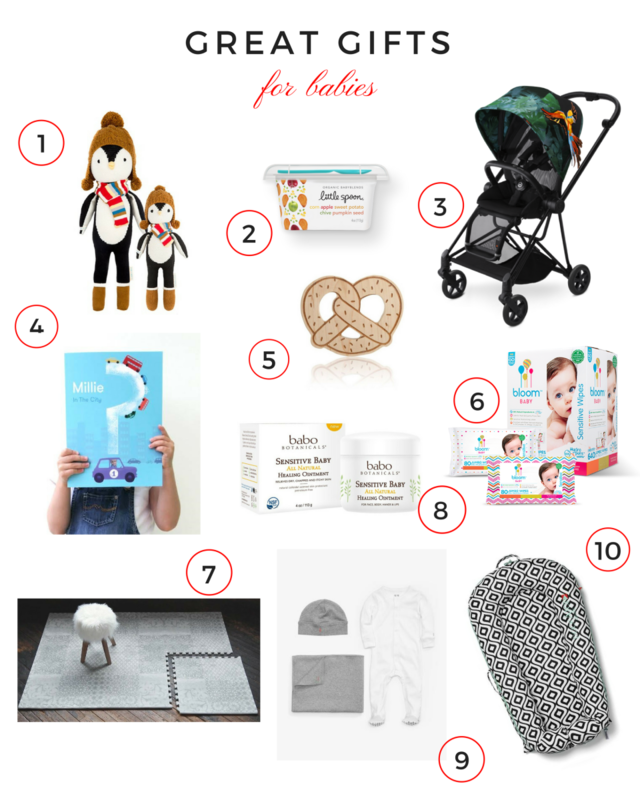 For this year’s gift guides, we’ve teamed up with some of our favorite bloggers (The Chirping Moms, Stroller in the City, Our Family Lifestyle, Divine Lifestyle, and Momtrends) for a collaborative gift guide series. We’re each covering our gifting “area of expertise” and therefore we’ll be able to share gifts for all different ages (from babies to teens and adults!). We’re kicking off the series with great gifts for babies, chosen by yours truly! 1. cuddle+kind&apos;s ethically-produced, hand-knit dolls aren&apos;t just adorable, they help feed children. For every cuddle+kind doll sold, 10 meals are donated to families in need. The dolls are made by hand in Peru, hand knit, hand loomed, embroidered and crocheted by artisans using knitting expertise that has been handed down through generations. The perfect keepsake for the little doll in your life. 2. A direct to your door, fresh baby food company, Little Spoon&apos;s Babyblends are designed for comprehensive nutrition for every baby at every age. Customize a plan for someone on your list without any long-term commitments. You can pause, cancel or make changes at any time. 3. The CYBEX MIOS supports the motto "design should not only have functionality, it must also be fun!" This new to market stroller provides maximum stability in a lightweight frame, offering an airy, floating appearance. The retro-modern seat design features breathable mesh to not only support the lightweight aspect, but also helps to regulate the child’s body temperature. The narrow design glides through urban or suburban bustle with ease. Compact, flexible, functional, and stylish – ideally suited to the needs of modern parents and babies. The Birds of Paradise and Butterfly Collection are favorites. 4. HeyWow! is a bit like "Where’s Waldo" but with real kids! A creative mum and dad team in Scotland create these brilliantly personalized, stylishly designed picture books for babies and kids featuring their name and photo on every page.‘In the City’ is an exciting hide and seek adventure where little readers discover themselves within 12 busy city scenes. 5. 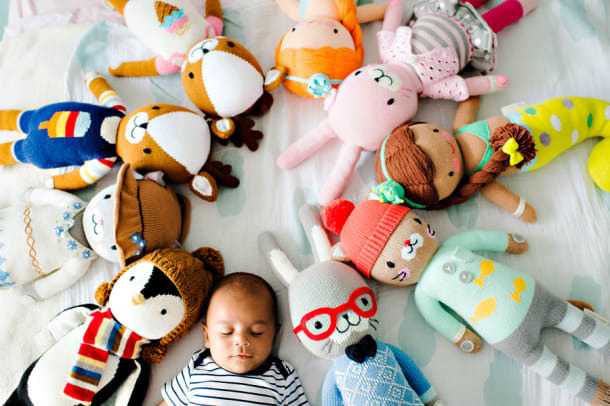 Spearmint LOVE is a trove of adorable baby gifts. Among our favorites are the teethers that come in fun designs like hashtags, cacti, bubble teas, and this organic pretzel wood one. 6. Specifically designed for sensitive skin, bloom BABY created its wipes with a wish list for all babies: safe, effective, all-natural, soothing, gentle on eczema, unscented, sensitive, hypoallergenic, organic, nut-free facility, gluten-free facility, animal cruelty-free, and the freshest water it could find (from Long Island’s natural glacial aquifer). The result is over-sized, textured, and durable baby wipes that keep baby&apos;s skin clean and healthy. Wipes and diapers are always a good idea. 7. Little Nomad transforms a space with certified EVA foam play mats that look like gorgeous rugs instead of the circus colored mats we&apos;re used to. Baby has a comfortable and cushy surface to play on and mom gets to keep her sensible design aesthetic. 8. Babo Botanicals&apos; natural hair, skin, and sun products collections are made entirely on a certified organic farm in upstate New York and are completely vegan (except the lotions that contain beeswax), free of parabens, phthalates, and artificial fragrances. Now Babo has released a line of sensitive skin therapy called Sensitive Baby. The products make perfect gifts for any tots on your list. 9. At the core of 12 | 12&apos;s mission is to give back and improve the lives of children everywhere. Its baby and toddler pieces are simple and safe, made from the softest organic, toxic-free fabric created in careful consideration of the environment. For every purchase, 12 | 12 donates an item from its collection to Baby2Baby. We love the gift sets and bundles. 10. One of my personal favorite pieces of baby gear is the DockATot portable, multi- functional baby "bed" for resting, lounging, and relaxing. It was created by a mom in Sweden with a strict emphasis on design and comfort. It&apos;s a glamorous option for feeding, soothing, and bonding with your baby and makes a fabulous gift with all its contemporary prints.